Milton Kotler, president of the Kotler Marketing Group, a Washington, D.C.–based global consulting firm, was walking through a Stockholm park on a summer day four years ago when he met a bride-to-be and her friends celebrating her upcoming wedding. Most economists don’t win such ardor from young Swedish women and other students around the world. But Milton’s brother Philip Kotler, the S.C. Johnson & Son Distinguished Professor of International Marketing at the Kellogg School of Management, is no ordinary professor. Over the past four decades, Philip Kotler almost single-handedly has put marketing at the core of business theory. His Marketing Management: Analysis, Planning, Implementation, and Control (Prentice-Hall, 1967) remains the most popular marketing textbook in business schools around the world; the Financial Times calls it one of the 50 most influential business books of all time. He regularly appears on lists of top management gurus and has received 11 honorary degrees from here and abroad. He has advised corporate giants such as AT&T, Bank of America, Ford, General Electric, Honeywell, IBM and Merck. Almost every trend in modern marketing — whether it’s a firm offering rewards to loyal customers, a city sprucing up its airport road, a museum creating special exhibits to attract new visitors or a store adding a cafe to make shoppers happier — can be traced to Kotler’s ideas. Kotler, 72, could rest on his laurels and spend more time on the leisure activities he loves: collecting glass art with his wife, Nancy, taking long strolls and visiting with his three daughters and six grandchildren. But he is still writing, teaching, speaking and searching for his next great idea. This year alone he has published three books, and he has three more in the works for 2004. Through these efforts he hopes to continue moving marketing away from its former role as the poor stepchild of the business world and toward the heart of economic theory, where it can have more positive impact on everyone’s lives. Philip Kotler sits in the office of his Glencoe, Ill., home, with dark eyes twinkling behind wire-rimmed glasses and thinning silver hair that complements his gray shirt and matching suspenders. He manages to look relaxed, friendly, stylish and authoritative at the same time. His office features a massive oak bookcase covering one wall and filled with shelf after shelf of books. A closer look reveals one name on most of their spines: Philip Kotler. There are the 11 editions of his classic Marketing Management. There are copies of the 35 other books he’s written, either on his own or with colleagues. And there are translations of these books in French, Hebrew, Russian and at least 20 other languages. 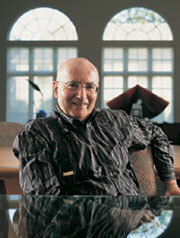 Kotler’s childhood and education prepared him for this success. He learned about marketing firsthand from his parents, Russian and Ukrainian immigrants who owned a store on Chicago’s North Side. After enrolling in an accounting/law program for two years at DePaul University, he switched to the University of Chicago, where he studied economics with Milton Friedman, the maestro of free market theory. He subsequently earned his PhD in economics from MIT under the tutelage of the legendary Keynesian, Paul Samuelson, and did postdoctoral research in mathematics at Harvard and in behavioral science at the University of Chicago. Kotler was teaching at Roosevelt University in Chicago when he was lured to Northwestern in 1962 by Donald Jacobs, then a young business professor, later Kellogg’s legendary dean and now Gaylord Freeman Distinguished Professor of Banking. Northwestern gave Kotler a choice — teach managerial economics, a staple of the curriculum, or marketing, a field then on the fringes of business theory. Don advised, “Do marketing. That field needs much more help.” Kotler agreed, and he and marketing have never been the same. Kotler began writing his own general marketing textbook that rebuilt the field on the foundations of mathematics, economics, behavioral science and organizational theory — all subjects he knew well. The next big idea Kotler wants to tackle is how business, government and nonprofits can use marketing theory to become more effective in meeting the needs of future generations. One of the books he is working on is tentatively titled Improving Government Services: A Marketing Approach. “I’m interested in what makes good government and a good society — caring for the poor and solving their problems, good education, a high level of health care, environmental protection,” he says with his calm voice, carefully measuring every word so it precisely captures his meaning. Sweden is not the only place where Kotler is huge. Twice a year he takes a two-week speaking tour of Europe, and now Oslo and Copenhagen have joined Stockholm in holding their own “Kotler Day.” He regularly speaks in South America and Asia. When Kotler shows up every other year in Bangkok, where former student and Marketing of Nations (Free Press, 1997) coauthor Somkid Jatusripitak (KSM84) is Thailand’s minister of finance, several thousand businesspeople will gather to hear Kotler speak. Next spring he is scheduled to appear with Bill Clinton, Rudolph Giuliani, Jack Welch and three other luminaries before 10,000 managers at Radio City Music Hall in New York City. Although Kotler has written a book on how celebrities and business titans can market themselves, he says he has never thought of the best way to market one of the biggest business names of them all — himself. In the living room of Kotler’s home stands a glass sculpture by the French artist Antoine Leperlier showing a stream of liquid pouring from a pitcher and just barely missing the cup below. Kotler loves this piece. It symbolizes, he says, how knowledge through the ages often doesn’t pass smoothly from one generation to the next. But since coming to Northwestern, Kotler has done his best to make sure the transfer of knowledge is successful. He has helped build Kellogg’s marketing department to the point that Business Week has named it the best marketing program for full-time MBAs since 1988 and for executives since 1996. In 1985 the American Marketing Association gave Kotler its first-ever distinguished marketing educator award. Kotler tells them marketing has changed dramatically since he first studied it. He sees businesses moving away from wasteful mass advertising and toward precision marketing, where they clearly identify and communicate with market segments and customers that they can serve and satisfy in a superior fashion. As an example, he notes how IKEA identified a market segment — young families setting up their first homes — and then successfully directed its resources toward meeting their needs: quality furniture, affordable prices, special deals for loyal customers, and restaurants and child care centers inside stores so families can more easily shop long hours. Kotler favors three types of companies: companies that innovate ways to lower the cost of living, such as IKEA, Southwest Airlines, Wal-Mart, Target, Home Depot, Dollar General and Aldi; companies that boost quality to higher levels: Sony, Lexus, Intel and Starbucks Coffee; and companies that have a social conscience: the Body Shop, Ben & Jerry’s, Avon and Kraft Foods. Businesses that want an edge often call Kotler for advice. Sony flew him to Paris in September to talk with some of its top people. Nonprofit groups such as the YMCA, American Cancer Society and United Way have also sought his counsel on ways to determine whom they should be serving and how to allocate their resources to do the most good. “Phil has been a mentor to a lot of people who brought a marketing mentality to the nonprofit sector,” says Marvin Pinkert (KSM84), director of museum programs for the U.S. National Archives and Records Administration. Since Kotler started writing about nonprofits in the 1970s, museums began thoroughly analyzing data to understand why some people frequent them while others never come through their doors. As a result, museums boosted revenues by crafting exhibits with specific segments of the public in mind, Pinkert says. Kotler is proud of his research and writing on “social marketing,” a field that he pioneered in the 1970s with Gerald Zaltman that developed concepts and tools to encourage citizens to adopt more positive behaviors such as regular exercise and better nutrition while decreasing negative behaviors such as using drugs and tobacco. He published a new edition of Social Marketing: Improving the Quality of Life (Sage, 2002) with coauthors Nancy Lee and Eduardo Roberto. But beyond helping specific businesses and nonprofit groups, Kotler’s lasting impact may come from the hundreds of thousands of students like Pinkert who have taken his classes or read his books. Martin Smoler (KSM73) liked Kotler so much that he took two classes with him. When Smoler recently mentored a new firm struggling with its marketing, the first thing he told its managers to do was read Kotler’s Marketing Management. Jon Marshall (GJ91), a freelance writer based in Wilmette, Ill., teaches reporting at the Medill School of Journalism.